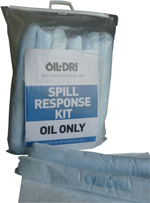 Spill kits include products to contain, absorb and dispose of spills according to the type of spill. Each kit contains socks and pads and disposal bags; larger kits include pillows. All kits include an instruction sheet and contents list. Oil – to selectively absorb oil and oil based spills whilst repelling water (white products). Chemical – to absorb all types of spills including water, oil, chemicals and corrosives (yellow products). Maintenance – to absorb all non-corrosive spills of water, oils and greases (grey products). Then select the size of the kit by its absorption capacity i.e. 15 litres to 130 litres. Select the type of container – standard kits come in a clear plastic clip-close bag. Premier kits come in a tough, blue nylon bag. If you cannot find what you need call our sales office on 01945 581244 or e-mail sales@oil-dri.co.uk for advice and costs on customised kits to provide products and absorption capacity to your individual requirements. Use disposal bags provided to segregate contaminated waste.